Cate Kennedy returns to the well-fortified ground of the short story with a new collection, Like a House on Fire. Here, she chats with Helen Garner. It was at the Wheeler Centre’s first Gala Storytelling night, when she stood on the Town Hall stage with barely a scrap of paper and rocked a crowd, that I saw what a natural Cate Kennedy is. She has the feel for shape and pace, the mastery of the pause and the undercurrent of complex humour that can only have been born in speech. ‘Everything’s ordinary in my work,’ she says when we sit down to talk about her new short story collection, Like a House on Fire. ‘The whole confessional thing, where you’re always taking your own emotional temperature, is no use to me. I don’t have any lofty ambitions. And I don’t want characters who are larger than life. I live in a very ordinary place, a farm on a river. I listen to other people and I hear what they’re saying. The gift is the ordinariness – things that are well-used, unexpressed, taken for granted. I love to look at those things in a fresh way. Indeed, a lot of watching happens in Kennedy’s work. When verbal communication fails, spouses, or parent and child, watch each other. In secret they gaze, helpless, while the other is sleeping, or walking away, or struggling with a social duty. Tender or shattering insights come to them in these moments of pained observation that can break a heart, or mend it – explosions of meaning that will force them to change their lives. A lonely husband, watching through the kitchen window as his driven, manically perfectionist wife sifts sugar onto mince pies, understands that they will never have a child. A woman, dumped by her partner, stalks him at night on the internet; her obsessive search for his traces becomes creative, an act of imagination in which wry healing begins. There’s a freshness in these powerful new stories, a sense that, as they grow, they are surprising not only Kennedy, but themselves. Within a story’s frame, emotional or psychological pressure will increase to an unbearable degree – then, almost imperceptibly, something shifts, and the paralysed situation cracks open to admit a speck of light, or a relaxation before the inevitable, or a surge of amazed compassion. Yet we never hear the thunderous footsteps of explication. She works with a very light touch. In one story, for example, a young mother is about to have tests for suspected cancer. The night before she goes down to the city hospital, she puts the house in order while her husband and children are asleep, sets half a dozen mouse traps, then stays up till dawn to complete her little boy’s school project. In a flood of inspired detail she fashions, as a bulwark against ‘something dark and airless trickling through her bloodstream’, a little world in a cardboard box, using whatever she can find in the household mess – icy-pole sticks, cellophane, playdough, moss. At dawn she walks out into the garden barefoot and surveys her territory. Dew drenches the hem of her white cotton nightdress. But all that’s left of the internet research is the white nightdress. We don’t need to know anything about its provenance to sense the mysterious meaning that it radiates. She looks pleased. ‘The inarticulate ones interest me, lonely men who are floundering, drowning in their grief and inertia. They have less at their disposal than women do, to get themselves out of their dilemmas. They can’t work out how to re-engage. When they do speak, often their words contradict what they’re actually feeling. They sabotage themselves with what they say. Perhaps the mother who’s been up all night, putting the finishing touches to her son’s school project before she goes to hospital, is an image of Kennedy the short story writer. Patiently she works hope and blessing out of the modest things that lie close at hand. 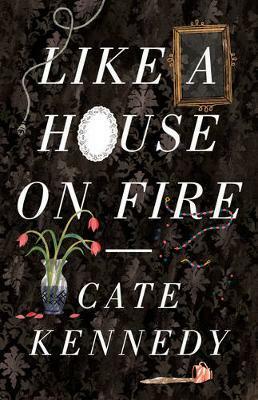 Like a House on Fire is out now in paperback ($27.95) and ebook ($17.09). Helen is an extraordinary writer: sharp, original, and bristling with intelligence. She has previously received a Walkley Award for journalism in 1993, and won the Melbourne Prize for Literature in 2006. Her latest novel is The Spare Room.